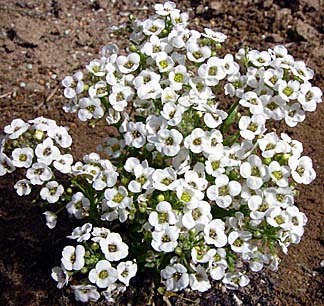 Over the years I've grown almost ever type of flower imaginable, from orchids to sweet peas, yet my all-time favorite has to be the unpretentious white Sweet Alyssum. A low ground cover, it's covered with tiny white flowers all year long that give off one of the most powerful and sweetest fragrances of any flower. It's great as a backdrop to other flowers. This picture above is a closeup of a newly planted transplant. In a month it'll cover more than a square foot and by the end of summer will form a solid mat that can stretch two feet in every direction.